Want a new look for your guest room but dread the thought of tearing out that old wallpaper? Why not leave it up? And paint! 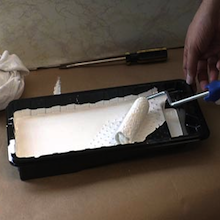 Rudy Escalante from Rudy’s Quality Painting shows us the secret QuickTip for painting over wallpaper.